On 9th Sep, 2018, the ceremony commenced with the playing of the national anthem, followed by a recitation from the Holy Quran. Chief Justice of Pakistan (CJP) Mian Saqib Nisar administered the oath in a ceremony which was attended by top civil-military brass including Prime Minister Imran Khan, Chief of Army Staff (COAS) Gen Qamar Javed Bajwa and Chairman Joint Chiefs of Staff Committee Gen Zubair Hayat. 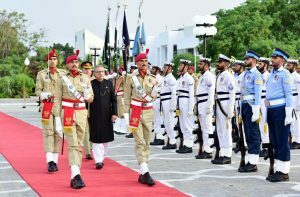 The newly-sworn in president was later given his first guard of honour by contingents of the armed forces at Aiwan-e-Sadr. Pakistan Tehreek-e-Insaf’s (PTI) Alvi was elected as the 13th president of Pakistan as the country’s Electoral College, comprising of the Senate, national and provincial assemblies, cast their votes on September 4. Alvi contested against two opposition candidates Muttahida Majlis-e-Amal chief Maulana Fazlur Rehman and Pakistan People’s Party senior leader Aitzaz Ahsan. According to the Election Commission of Pakistan (ECP), Alvi won after bagging a lion’s share of votes with 353, followed by Fazl with 185 with Ahsan coming in last with 124 votes. The election of the PTI marks the end of decades of rotating leadership between the ousted Pakistan Muslim League-Nawaz (PML-N) and the Pakistan People’s Party (PPP). Pakistani presidents wielded greater power before 2008, when President Asif Ali Zardari, the husband of assassinated premier Benazir Bhutto, took office and devolved most of his powers to Prime Minister Yusuf Raza Gilani. Few lines for introductory background of our newly elected President, he was born in 1949 and a dentist by profession, Arif is among the founding members of the PTI. He served as the secretary general of PTI from 2006 to 2013. Alvi was elected as the member of the National Assembly of Pakistan for the first time in General Election 2013 on a PTI ticket from the NA-250 constituency of Karachi. Looking at the move of democracy, The army chief expressed his view, “Democratic institutions are quickly becoming more robust and will only get stronger with the passage of time,” He termed Alvi’s oath-taking as an important day for the democratic process in the country. When his comments were sought on the swearing-in of the new head of state, General Bajwa termed it a “significant and wonderful moment” for the continuity of the democratic process. After oath taking ceremony then exchange of vows and congratulatory messages from different countries and leaders start. President Dr Arif Alvi, while underlining the significance of China in Pakistan’s foreign policy, said that he looked forward to strengthening the strategic partnership between Pakistan and China in all areas. The president said this in a meeting with Chinese State Councilor and Foreign Minister Wang Yi who called on him at the Aiwan-e-Sadr. The Chinese State Councilor led a high-level delegation, including three ministerial level officials. The foreign minister congratulated the president on his assumption of office and conveyed the good wishes of the Chinese leadership for the new government. He said that he was honoured to be the first to have a meeting with the president immediately after his oath-taking ceremony. The president thanked Wang Yi for the message of goodwill from the Chinese leadership and reiterated the resolve to work with China to take the bilateral relationship to new heights during his tenure. Recognizing the significance of CPEC for both the countries, President Arif Alvi re-affirmed the commitment of the government towards the implementation of the CPEC. Separately, Saudi Arabia’s Information Minister Awwad Saleh al Awwad met President Alvi to congratulate him on becoming the country’s president. The Saudi minister is on a two-day goodwill visit. The visiting dignitary conveyed felicitations and goodwill wishes of the Saudi leadership and their desire to work closely with the new leadership in Pakistan and to forge closer ties. Alvi, who took oath of office earlier in the day, welcomed the Saudi dignitary and expressed his deep appreciation for the warm message of felicitations by the Saudi royal family and the kingdom’s people. Graduated in Mass Communication from Punjab University. I have worked in Daily Jang and Aaj News TV. Currently doing job as an Administrator in Federal Board of Revenue, Islamabad. Thanks for giving us such kind of article.